On Saturday, Dec. 17 and Sunday, Dec. 18, Mayor Carl Wright of Sloatsburg and Mayor Ed Markunas of Suffern proudly hosted “Christmas Turkey Dinners To Go” lead by Korean War Veteran, Richie Jarcho, and The Veterans Angels. The Veterans Angels, a local non-for-profit group, provides service dogs to veterans at no cost for purposes of mobility assistance and to aid in recovering from Post Traumatic Stress. In addition to providing service dogs to Veterans, the Angels also help Veterans by donating food during holiday seasons. 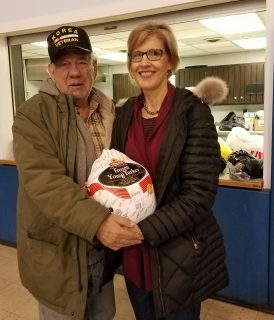 On Sunday at the Suffern Community Center, Veterans Angels supplied Christmas Turkey Dinners To Go to 60 Suffern Veterans and their families. In addition to supporting local Veterans, Richie and the Angels also donated an additional 50 turkey dinners to Suffern families in need during this holiday season. Thanks goes out to Richie Jarcho and the Veterans Angels for their dedication, commitment and support, and acknowledgements and thanks to Active International, Inserra Supermarkets and the Suffern Dare Program for their generous donations. Events like this are made possible due to all of the volunteers, including the Suffern Police Department, who gave their time to make this event a huge success!